Hey everyone! 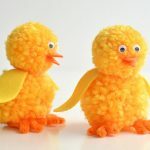 It’s Megan from Homemade Ginger and I’m back to share another craft that’s perfect for spring. 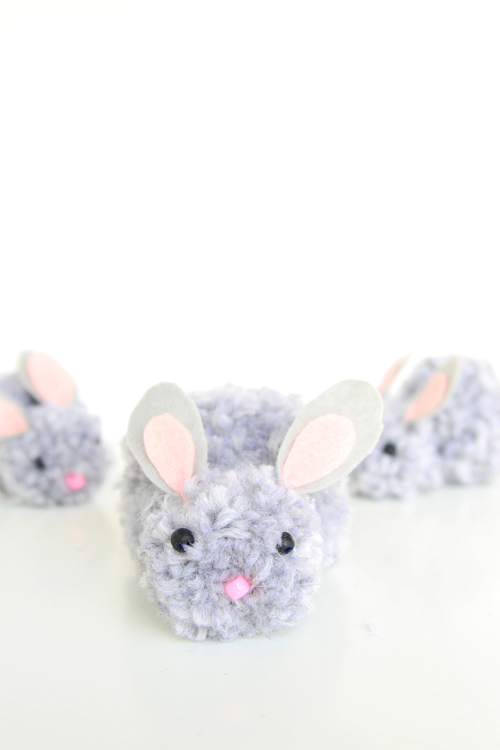 These little bunnies are super soft and so fun to make! I discovered pom pom making this year when I was in the process of wrapping Christmas gifts. I was addicted to making them in all sizes and colors of yarn to top my gifts. 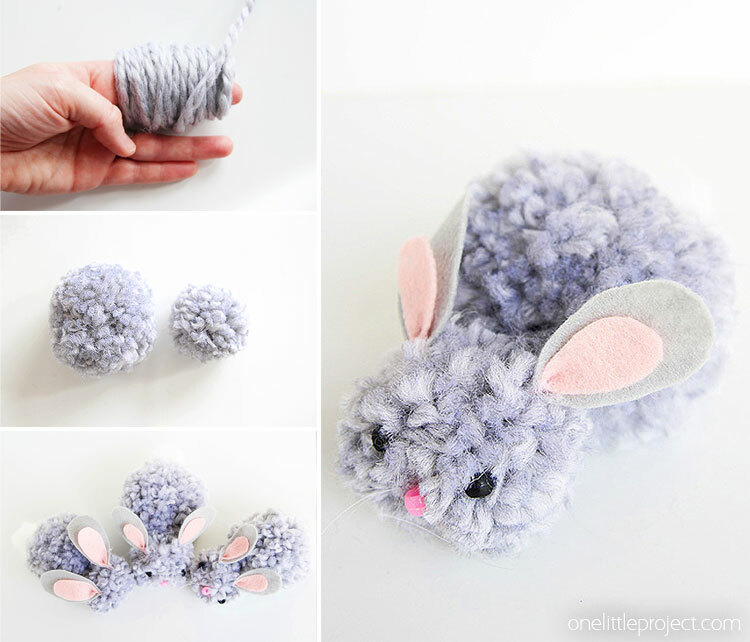 When I saw these pom pom bunnies on Pinterest, I was ecstatic to realize that my pom pom making did not have to stop with the holidays! 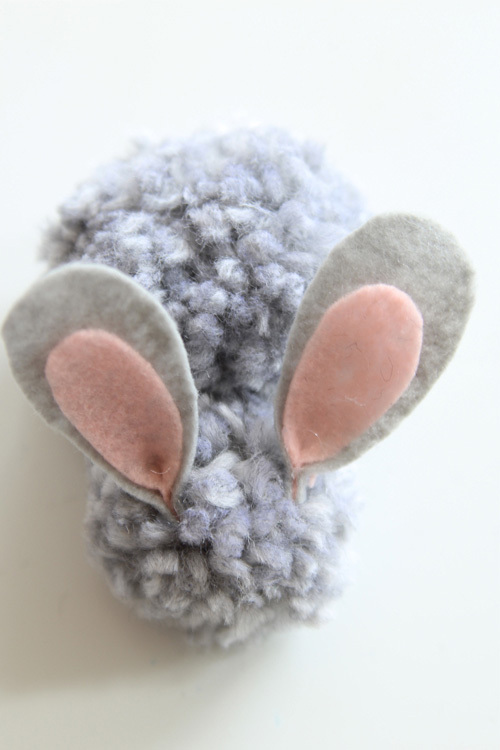 For some reason, animal crafts always inspire me for spring. I recently made some animal confetti globes (like snow globes for spring!) 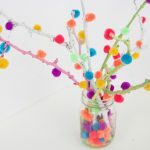 If you were really creative, you could probably come up with a variety of different animals to turn these pom poms into. You could also experiment with different colors and sizes! 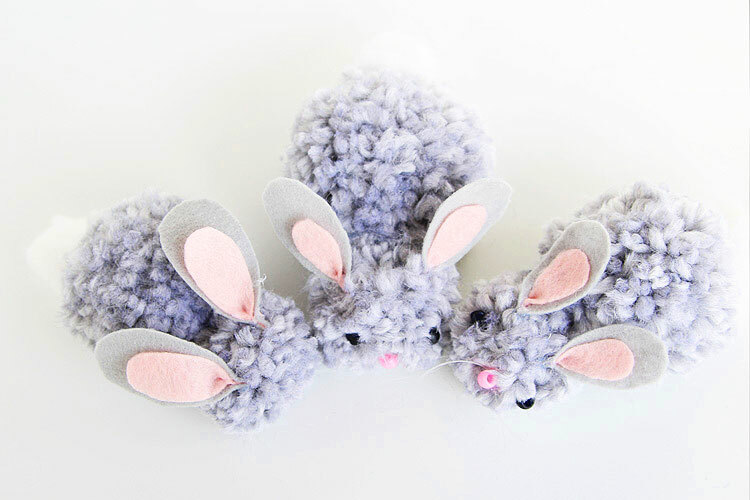 Although, I think these simple gray bunnies are just perfect for Easter! I will be the first to admit that this project is not the quickest craft you will ever make. 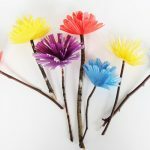 Trimming the pom poms to get them just right can be addictive and a little time consuming, but it’s such a fun project to do while watching your favorite show on Nextflix. My older girls also love giving the poms a “haircut” and putting together these bunnies, so it’s a great one for kids too! 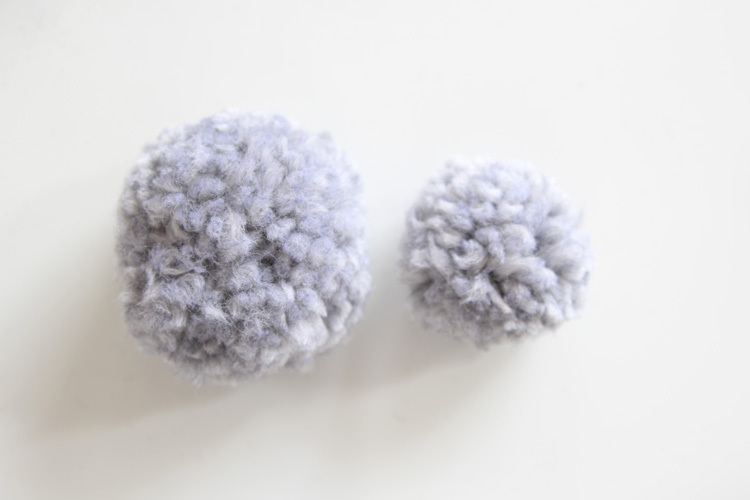 The first thing you need to do is create your pom poms. Like I said earlier, you can make these in any size. 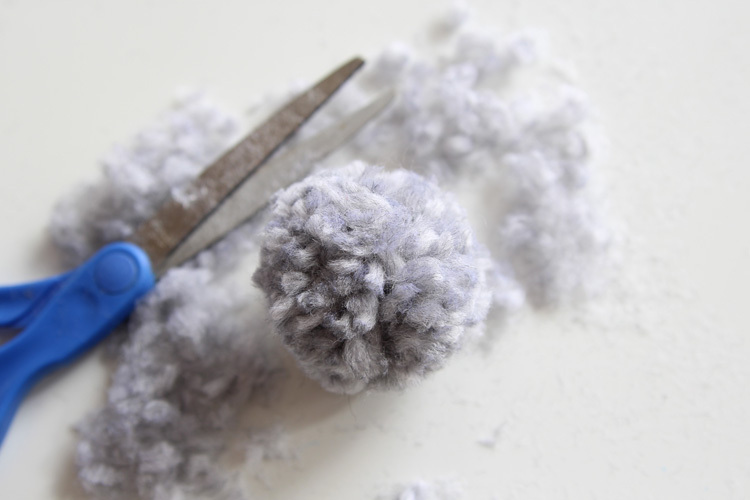 I know there are tools out there to create the perfect pom poms, but I just used my hands! 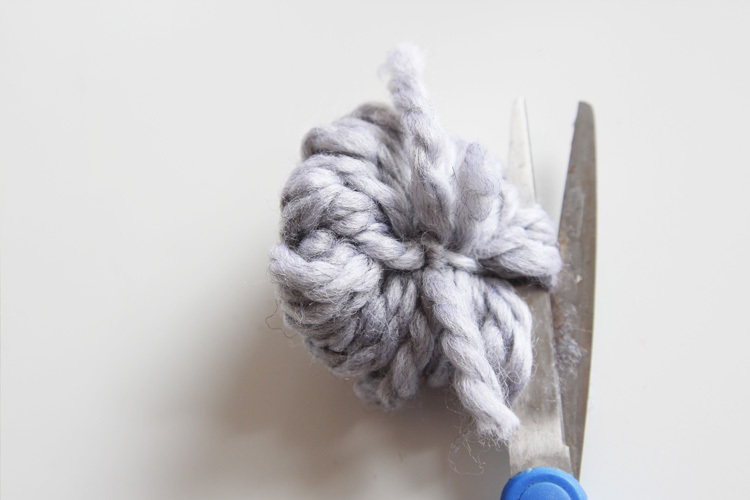 For a smaller pom pom, begin wrapping yarn around two fingers. Just keep going and going until you have a thick amount of yarn. I probably wrapped it about 60 times. 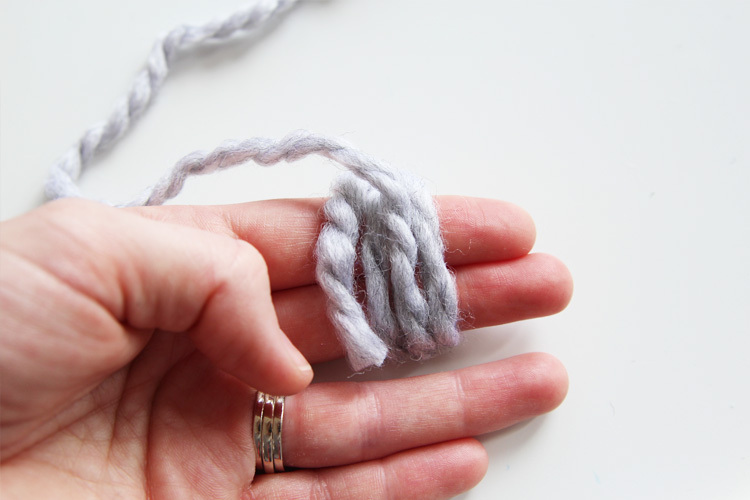 Carefully slip the looped yarn off your fingers and cut a separate 5 inch piece of yarn. 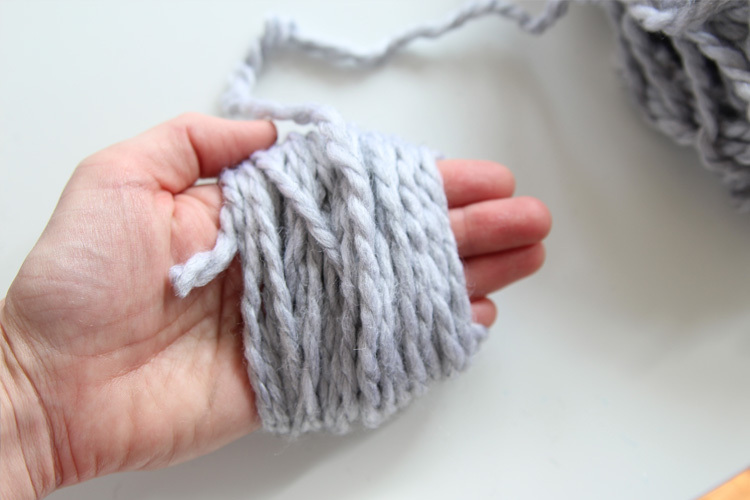 Slip it underneath the looped yarn and wrap it around to the front, tying it REALLY TIGHT. Now, slip your scissors through the loops and cut. 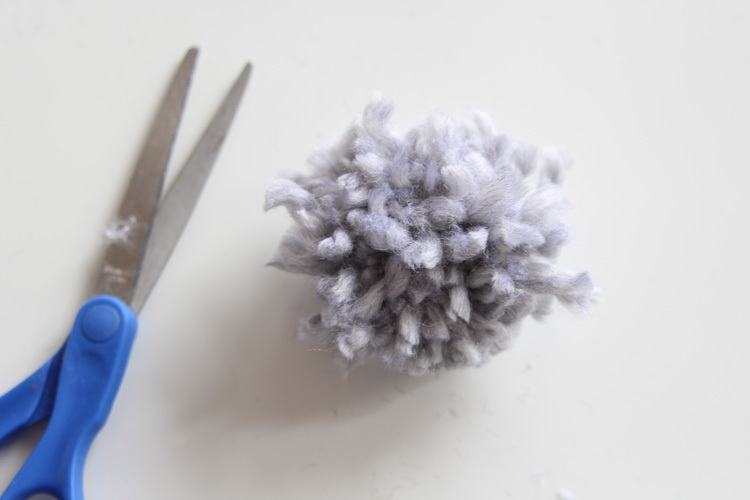 Keep cutting all the loops until you have a wonky looking pom pom. Now trim it up and give it a “haircut” until it looks nice and even. 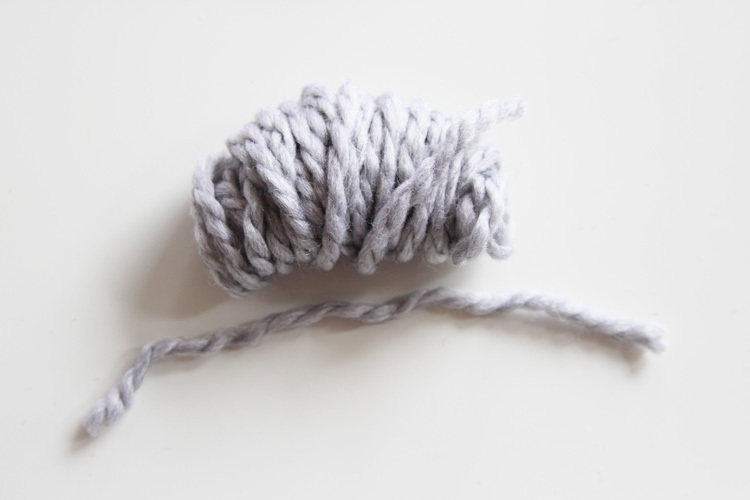 For a larger pom pom, do the same exact process except wrap the yarn around your entire hand. 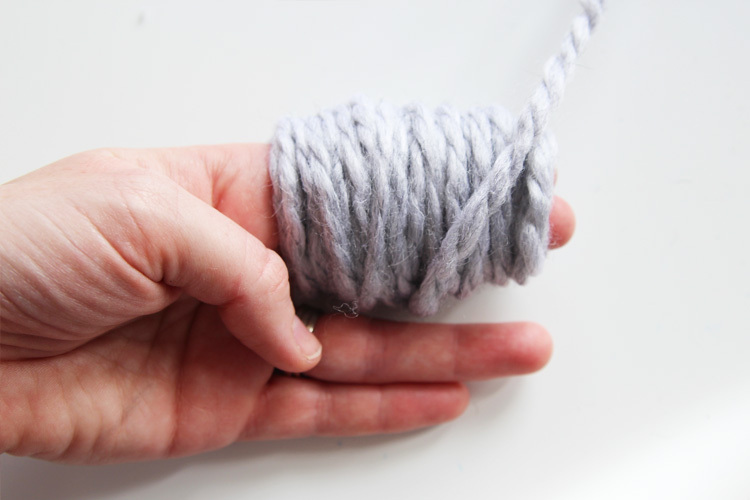 You could even do some with just three fingers or wrap the yarn around a fork for various sizes. 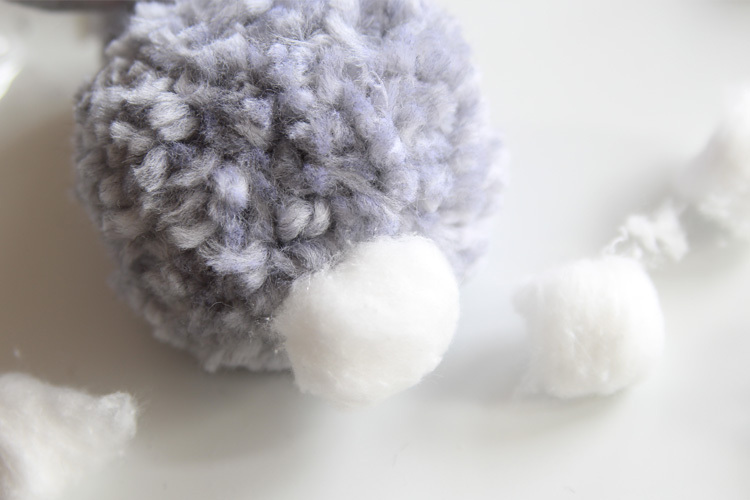 Using hot glue, attach the large pom pom to the small one. Now it’s time to make the ears. 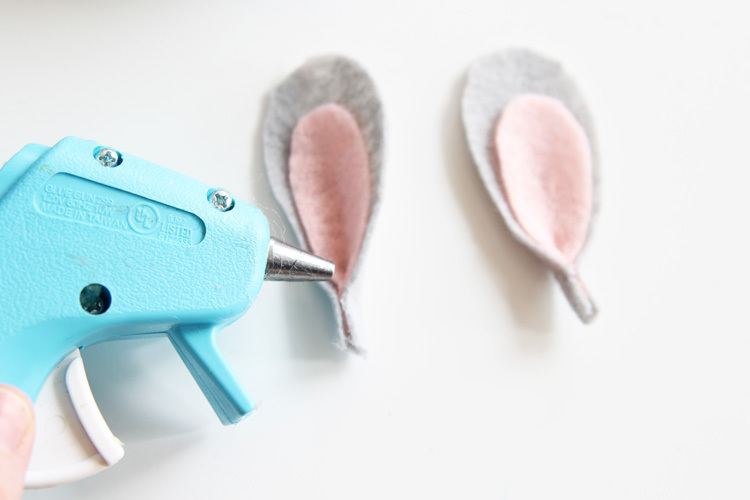 Cut out some ear shapes out of gray felt and a smaller shape out of pink. Layer the pink on top of the gray and pinch the bottom. Glue the pinched portion together. Glue the ears to the head of the bunny. Next, you want to glue on the black pony beads for eyes. 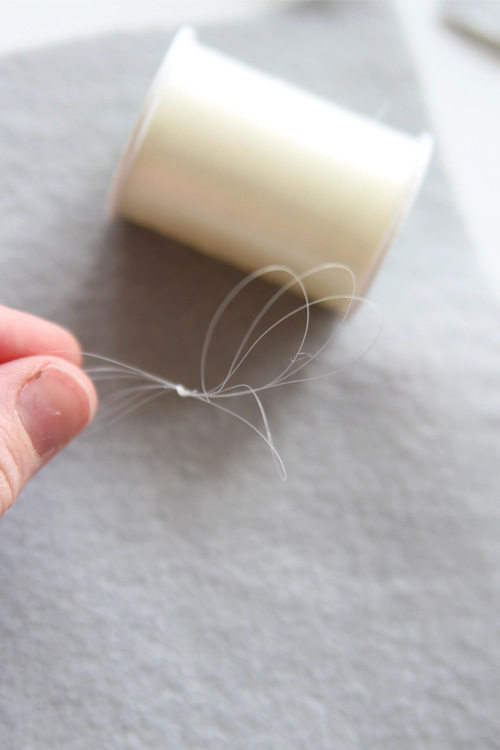 For the whiskers, loop some clear thread together and tie it in half. 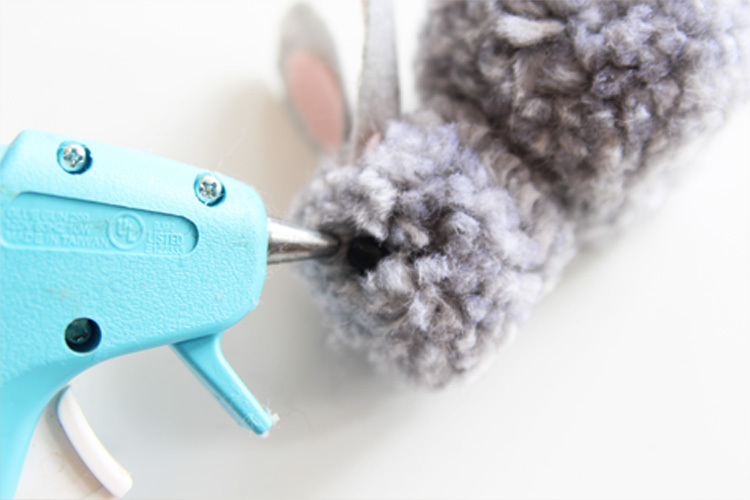 Snip through the loops with scissors and glue it on the bunny’s face. Glue the pink pony bead on top for the nose. 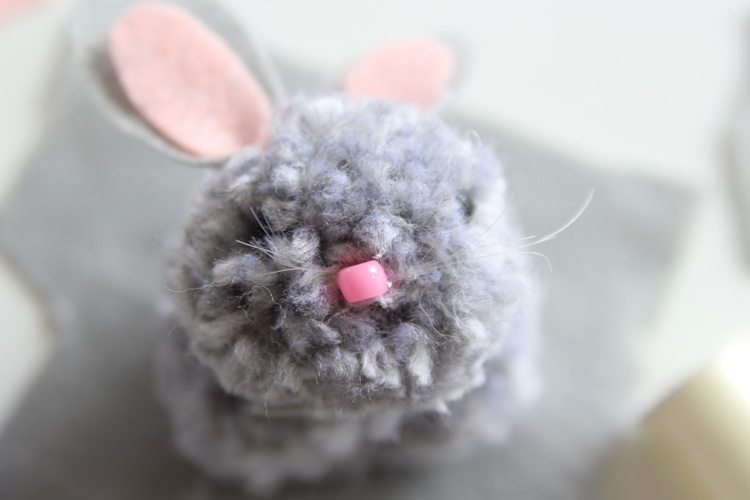 And finally, add a cotton ball for the tail if you want! 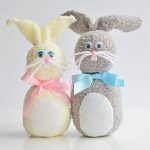 These little guys would be so cute peeking out of an Easter basket. And I’m sure the kids will have a blast playing with them because they are SO soft and cuddly! 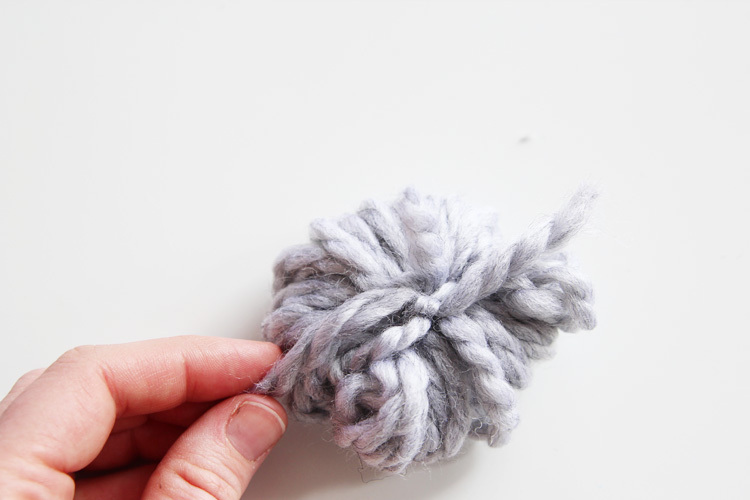 For a smaller pom pom, begin wrapping yarn around two fingers. 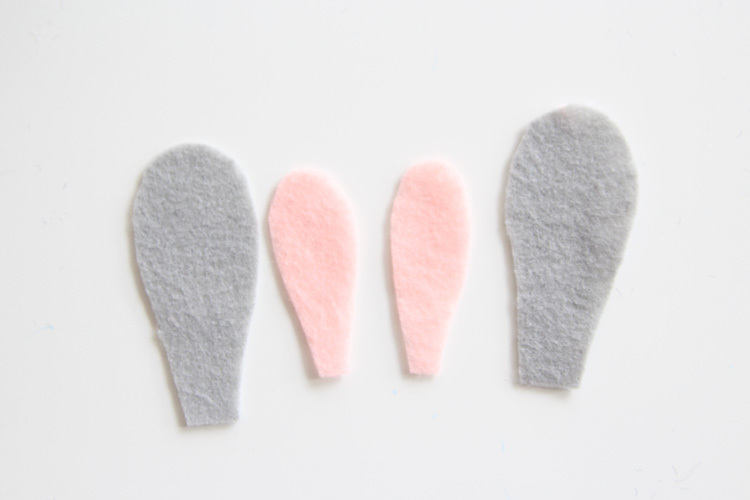 Cut out some ear shapes out of gray felt and a smaller shape out of pink. 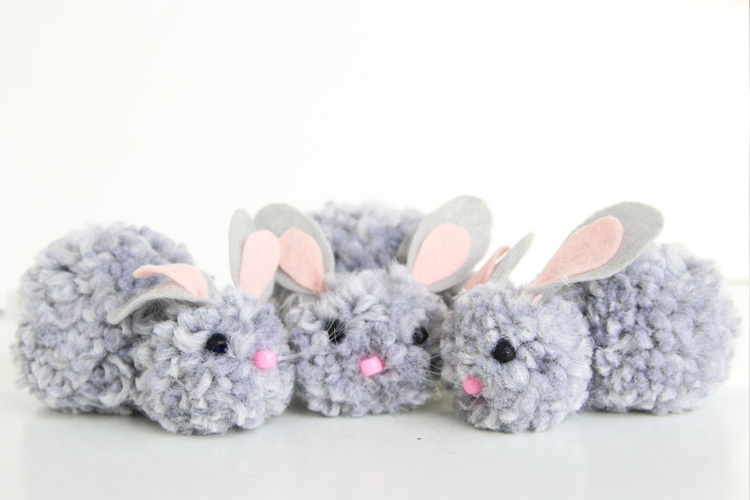 Turn on your favorite show and make these soft and snuggly little bunnies! 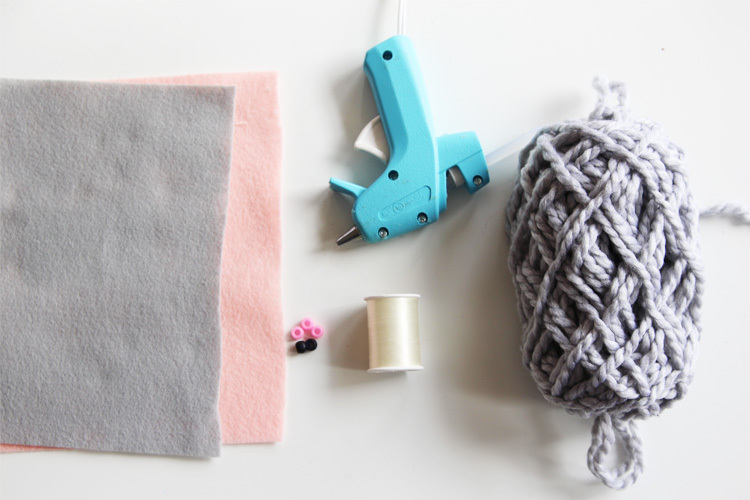 Make them in all different sizes and you will find the process a little addicting! 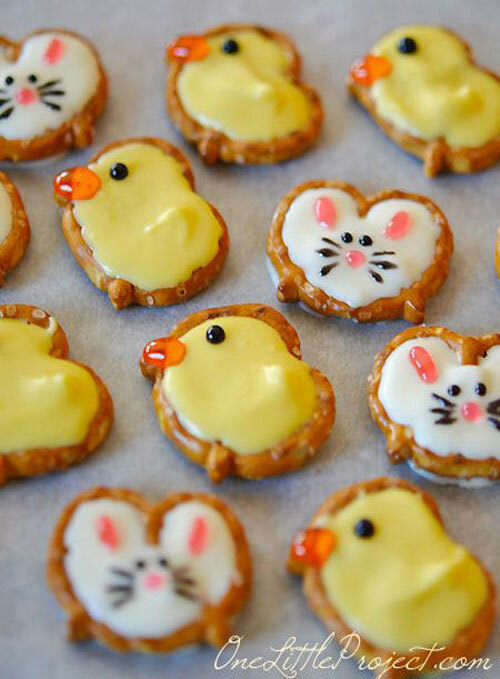 If you’re looking for more fun things to make this spring, check out our tutorial for making pretzel bunnies and ducks. These are so simple and look so adorable!